Research using DNA technology has highlighted the importance of moa in the diet of the first New Zealanders. Scientists from this country and Australia studied significant 13th to 15th century archaeological deposits along the east coast of the South Island. "The abundance of moa in early archaeological sites demonstrates the significance of these megaherbivores in the diet of the first New Zealanders," the study, published in the journal Quaternary Science Reviews, said. That included consumption of moa eggs, with the scientists saying the intensity of moa egg collection showed moa were exploited heavily at all life stages, combining to accelerate their extinction. Eggs from at least 105 individuals were identified from the seven archaeological sites studied. Those included 50 eggs identified at Wairau Bar - a number that likely represented a considerable proportion of the total reproductive output of moa in the area. "Moa were large, long-lived ratites and were most likely slow reproducers with small clutches… The level of exploitation observed could have put the moa under extreme and unsustainable reproductive stress." The researchers amplified the mitochondrial DNA from 251 of 323 eggshell fragments and from 22 of 27 bone samples, with the analyses revealing the presence of four moa species. Polynesians had arrived in New Zealand in the late 13th century, and archaeological deposits and dating of sites suggested a rapid expansion along the South Island east coast. "These earliest inhabitants would have encountered a heavily forested landscape, well provisioned with wild food resources," the study said. At the time of human contact, New Zealand was home to about 245 bird species, many of them flightless. Within a century or so many had been hunted to extinction, including the moa. There had been nine species of moa, ranging in height from 50cm to 200cm at the back. Unlike extinction debates involving northern hemisphere or Australian megafauna, there was little controversy that moa were driven to extinction by a combination of direct hunting and the indirect effects of manmade fires. The study identified Wairau Bar, at the mouth of the Wairau River in Marlborough, as arguably the most significant, and certainly one of the earliest archaeological sites in New Zealand. 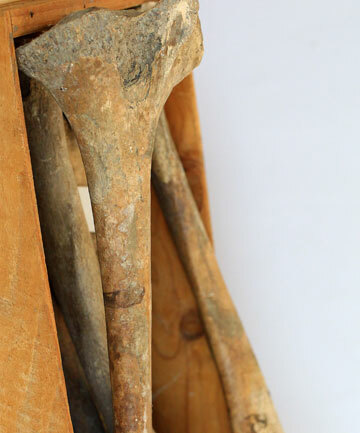 Large quantities of moa bone and eggshell had been excavated from the site in several periods of study. Skeletal remains from more than 40 Polynesians had been discovered, representing the burials of some of the first people in this country. "The inclusion of moa bones and eggs in the human burials at Wairau Bar reflects the value placed on moa," the study said. Wairau Bar, in particular, along with other archaeological sites in New Zealand, presented an exceptional opportunity to examine the level of exploitation of extinct megafauna. The cause and timing of other megafaunal extinctions were often challenging to pinpoint, as clear examples of human over-exploitation were rare. Molecular sexing carried out on 11 moa bones found a ratio of 2.7 males to every female, which may suggest access to the males was easier, the study said. Reasons could include males being slower, smaller and perhaps less timid. An alternative possibility was that, as with other ratites, male moa were the main egg incubators and therefore would have been extremely vulnerable. It could be that paternal incubation was favoured in moa to reduce the risk of egg breakage, given that female moa were up to 200 per cent heavier than males. More bones would have to be sexed and dated to confirm whether males were preferential targets.